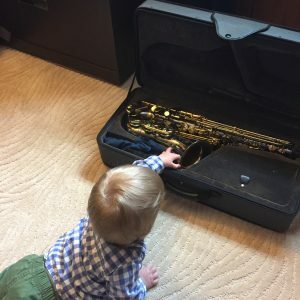 Until this past month, I really hadn’t touched my saxophone since my son was born. But then I was recently asked to teach saxophone lessons. At first I was reluctant to accept the opportunity because I didn’t see how I could possibly make time to practice. Between working full-time, helping take care of a baby, and my endless pile of side projects I didn’t see a way to make room in my schedule to get out my saxophone every day. Then I began wondering if it would be possible to watch a baby while practicing. I should make sure to mention that if you plan to be practicing saxophone while babysitting (not your own kid), make absolutely sure that the parents are OK with this. There’s a general principal here: You never know what you’re capable of until you try. My eyes are needed at all times, so I have to practice from memory. Glancing at a measure or two, I play through the music (while I know the boy will be safe for ten seconds) to learn what it sounds like. I just let the metronome do its thing and repeat what I saw and heard from memory. While it was difficult at first, I quickly learned to play the music by ear. And just like that my music is memorized. I then drill it down until I have another ten second window and then learn the next few measures. Now, not only am I practicing saxophone while babysitting my son, but I am watching him more attentively, interacting with him through the music (he thinks it’s great), and learning the extremely valuable discipline of memorizing my music (a skill I need to have anyway). Another exercise I’ve been doing in the morning before anyone is up is key clicking exercises. Even the quietest saxophone makes a little noise when pressing the keys. I set the metronome at a slower tempo than I’m used to and work on my technique. 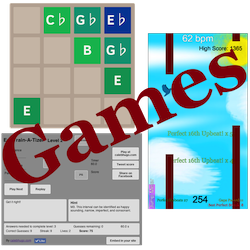 I click through scales, arpeggios, and tougher passages of music I’m working on. This allows me to practice silently during nap time or before the kid is up while refining my technique faster. Faster because listening for a key click instead of a pitch change forces my fingers to respond more quickly than if I were putting air through the horn since the sound of the key click happens first. The exercise exposes even the most subtle sloppiness so that I can clean it up. But even more than that, it allows me to focus on my hands instead of the sound. Sometimes it’s appalling at how far my fingers are coming off of the keys! As a bonus, I can even listen to an audio book or a podcast at the same time. I’m sure that having more than one child would drastically change the dynamic (see what I did there) of practicing saxophone while babysitting, but you never know until you try!